What kind of fronts are there; and what do they do? A front is the boundary that is separating two separate air masses when they collide. 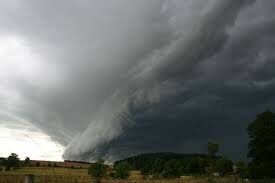 There are four types of weather fronts on Earth. They are; Cold fronts, Warm fronts, Occluded fronts, and Stationary fronts. They can appear anywhere on the map and there can be many of them on one map at any given time. A cold front occurs when a dense, colder air mass is replacing a warmer, less dense air mass. This type of front on the map looks like a blue line with triangles pointing in one direction. 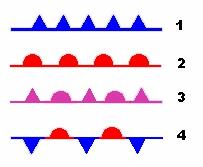 The cold front travels in the direction of the triangles. This type of front brings cold, sometimes snowy, rainy weather to the area its affecting. It will be cooler when the front passes. A warm front occurs when a warmer, less dense air mass is replacing a colder, more dense air mass. This looks like a line with small, red half circles. The warm front usually moves southwest to northeast. This type of air mass brings warm, somewhat rainy weather to the area that it is affecting. It will be warmer when the front passes. A stationary front occurs when a warm and a cold air mass collide, but they don't have enough power for one of the to be able to go over the other one. This means that the front just stays in place and once one of them has enough power to go over one of them. This looks like a line with triangles and half circles in different directions. This can bring rain to an area for several days at a time, depending on how fast one of the fronts can gain power. Warm weather follows this. 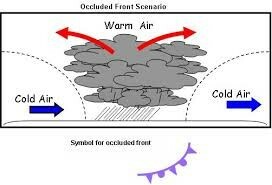 An occluded front occurs when two cold air masses trap a warm air mass above it. The warm air mass gets pushed up because the cold air is less dense than the warm air. This looks like a purple line with triangles and half squares pointing in the same direction as one another. This type of front can bring light rain to the area it's affecting. Cool weather follows this. Some storms that cold fronts bring include; thunderstorms, snow storms, blizzards, and hail storms. Some storms that warm fronts bring include; fog, or small amount of rain in the area. Some weather that occluded fronts bring include; light, moderate or heavy rain. Possibly a thunderstorm or two. What clouds form with a cold front? The main type of cloud/clouds that cold fronts bring include; cumulonimbus clouds. This is why there are heavy thunderstorms. What clouds form with a warm front? 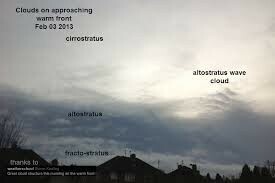 The type of cloud that warm fronts bring are usually stratiform (stratus) clouds. They are usually blanket like clouds that look quite smooth but sometime they're not so smooth.